Whether you are an avid pool player or you trust your mighty 8-ball to make your decisions, this new sword cane is the one for you! Equipped with a 15 1/2" stainless steel blade that slides securely into the aluminum shaft. 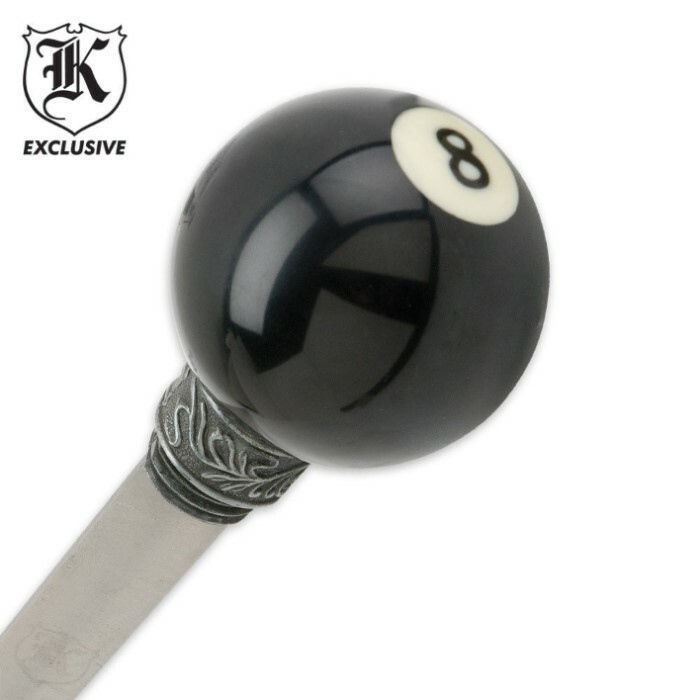 The handle is a solid black 8 ball with cast metal throat. Stretches 35 1/2" overall. But it just arrived, and frankly I am surprised. I found it solid, of sufficient height, for someone 6'5'' (which was a concern) as for being hard to grip? (re:other review) if you have normal to larger hands, you will find it comfortable. Can you use it as a sword? Not really. Primarily as you have to unscrew it several turns to expose the dull as butter blade. But do not take that as criticism, for it is not. By have this cane you have a solid cane/club (SOLID) and should you not be able to drive off an attacker with a ''METAL BAT'' you will have had time to unscrew it by that time and a shiny pointed object (sharp or not) is a further deterrent. Finally, unless you are lucky enough (like me) to need a cane (go me) and a doctor can document it if necessary, it might be best to not be brandishing a concealed weapon, if you are not handicapped (i.e. placard parking holder) or SSDI receiver, when you go to court for a drunken sword fight. Food for thought. The cane 2 big thumbs ups WELL WORTH IT !!!! I was very excited about getting this cane, and it certainly lived up to expectations. I ordered it for a friend, and both of use were very impressed. When I told how inexpensive it was, they didn't even believe me! Very solid, very cool, and a very good investment. Great price, fast delivery, and awesome products. Very durable. It seems to be a solid cane; but as everyone else experienced, it does make noise as you step along due to the blade just floating inside the cane. Otherwise, it had a great price; and at least the cane should be of lengthy duration. 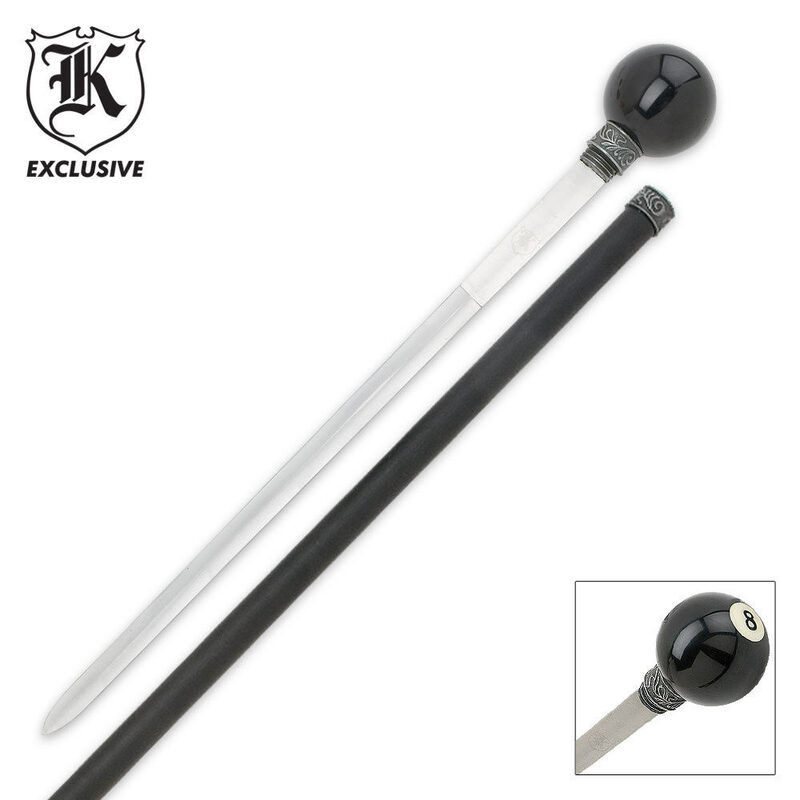 Nothing screams "Classy Fella" like an 8-ball tipped cane. Toss in an 18 inch screw-out blade and just forget about it! As other reviewers have noted, the blade rattles around a bit, but if you stuff some pink insulation down in there it's all good in the hood. Honestly, by the time you get the sword un-screwed you'd probably be better off just braining your would-be attacker with the (very real, very solid) 8-ball end, but that's not the point ... Like painting your toenails pink - only YOU know it's there, and everyone likes to feel special now and then, right? All-in-all a cool product that you shouldn't rely on more than you would a heavy stick, but absolutely worth the price if you need steadying while strutting around in your platform heels and polyester-print slacks. Good feel and balance to the cane the ball is fine for my big hand. No I wouldn't want to fight the 3 musketeers with the sword but it would be more than enough when faced with any pocket folder. As for the clanking a squirt or two of the spray foam insulation should cushion the blade. Just remember that stuff really expands and a little goes a loooong way. This is why I recommend s couple squirts you don't need to fill the whole cane just enough to keep the blade from contacting the sides (remember only the tip of the blade will be making contact). Hope this helps. Hey I got two...I would recommend it to all.. It is really done tastefully and the things wrong with it are out weighed by the good things...over all it is something that can make a great gift and a wonderful conversation piece...The shipping and the speed of which I received my merchandise was amazing. Blade is very dull, eight ball is real but that makes it hard to hold steady for use as a cane. Very good looking, nice value as an oddity, but not as a usable cane or as a weapon for cutting. Love the cane. Sturdy, practable, stylish, triple use: cane, club and blade. BUT I need help with the clanging when walking. The blade hits the sides making a loud noise every time it hits the ground.? Can anybody suggest a solution? The cane is great for the money. The 8 ball is real and has good weight. The cane would stop someone with the sword or hitting them with the ball. Good buy!